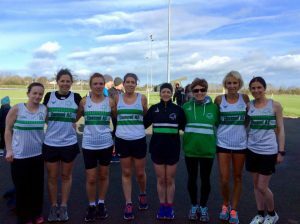 The County Senior Road Relays took place last Sunday in the Clonoulty Rossmore GAA complex where conditions were dry but cold. In the women’s event we had two strong teams competing in an event where the distances were short as the event consisted of 800m 1500m, 800m and 3000m. Still our teams performed very well. Our 1st team of Ann Marie Boland 800m, Aine Roche 1500m, Ali O Connor 800m and Kealey Tideswell 3000m all ran very well when winning the Inter Club Silver medals. Then our 2nd team of Nicola Maunsell 800m, Ann Marie Halpin 1500m, Sarah Whelan 800m and Suzanne Shine 3000m also put in a great team effort when finishing 5th team overall to win the Section B Silver medals in what was a very good competitive event. 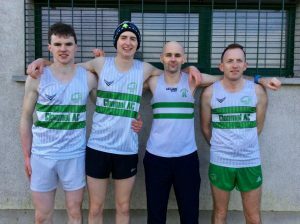 In the Men’s race our team of Anthony Bowen 800m, Nigel O Flaherty 1500m, Brian Carroll 800m and Conor Ryan 3000m also put in a very good team effort to win the Gold medals in the B Section after a great tussle with Moycarkey Coolcroo and Dundrum in the team event. It was great to see these athletes run so well over these short distances, a great way to get the 2019 season off to a flying start.